Bit O'Heaven: Simply marvelous meals in historic Ogden. I suspect the Wiki generation may not know what “two bits” means. I had to look it up myself. My dad used to give me two bits—25 cents—to “stop playing that goddamned guitar!” So, I knew Two-Bits equaled a quarter, four bits was 50 cents, eight bits was a dollar, and so on. I didn’t know though that the “bit” was a unit of currency in the colonial period, worth an eighth of a dollar, or 12 1/2 cents. Hence, two bits equaled 25 cents. Ogden’s Two-Bit Street Café is located on Historic 25th Street, thus the “Two-Bit” designation. 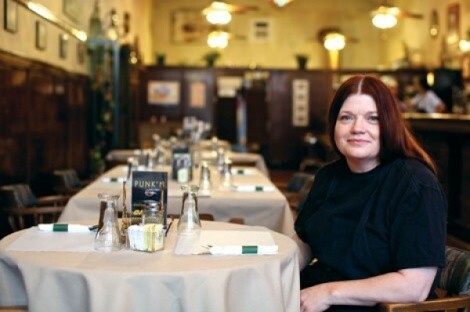 Penny Allred took over the historic tavern a couple of years ago, and has quietly been cooking up a storm there ever since. Entering Two-Bit Street Café is like entering a time warp. The eatery—which is a combination antique store, gourmet food market and deli, restaurant and bar—seems like it should have swinging saloon doors and a place to tie up your horse out front. At one time, it probably did. These days, we call restaurants like this eclectic. The truth is, it’s just weird. And I mean that in the most flattering way. We need more weirdness in this world. Two-Bit Street is anti-trendy and the antithesis to uninteresting cookie-cutter restaurants. This place has personality. The menu ranges from breakfast items like grits, biscuits and gravy, latkes, omelets and a tempting chorizo sausage and cactus (nopalitos) scramble to burgers, grilled sandwiches, soups, salads and entrees such as roast pork tenderloin and a wild salmon filet with creamy cucumber dill sauce. Rounding out the offerings with pastas and desserts, there is truly something for everybody at this kitschy café. With the exception of a “Champagne” mimosa made with cheap Cook’s bubbly at Sunday brunch, there’s been nothing at Two-Bit Street Café that I haven’t liked—loved, even. And, the $3 Bloody Mary made up for the less-than-memorable mimosa. I’ve written elsewhere about the “Cuban Tampa Bay” sandwich ($7.95): ham, pork, Swiss cheese and Dijon mayo on pressed, Cuban-style bread that’s baked in-house specifically for this sandwich. While perhaps not an “authentic” Cuban, this is a very tasty sammy. The same is true of the Mediterranean melt, a ciabatta bun stuffed with roasted red peppers, artichoke spread, spinach, olives, red onion and melted provolone. Priced at a reasonable $5.95, it also comes with thick and crunchy homemade potato chips. Sibling appreciation aside, Bill is correct: Great stuff does spring from the tiny Two-Bit kitchen. For example, a big bowl of about three dozen steamed Little Neck clams ($10.95) is a wonderful starter. The clams are cooked in a classic wine and butter broth and served with a hot, freshly baked French mini baguette for soaking up on the savory sauce. And, Bill is also right about the entertainment at Two-Bit Street, which can break out at any time in the form of co-owner Dayley’s impromptu magic shows, which just add to the wonderful weirdness of this joint. Speaking of weird, the market/deli adjacent to the café proper features an odd array of gourmet foodstuffs, everything from curry pastes and exotic spices to cans of Café du Monde coffee, plus a deli counter where customers can order deli meats and cheeses or sandwiches. I intentionally ordered my cheeseburger ($4.95 with chips) sans additional accoutrements, because I wanted to actually taste the meat. Allred even came to our table to verify that I’d ordered my burger “dry.” It was an honest, delicious burger that tasted like one you’d grill at home, made with one-third pound of real beef, no filler, and served on a big, high-quality bun. It was simple, straightforward, and one of the best burgers I’ve had in this state. Other good things include cheese tamales in a green chile sauce ($12.95), organic chicken breast with a citrus-Dijon glaze ($15.95), wild halibut in lemon-caper sauce ($18.95) and an Argentine-style “gaucho-grilled” sliced beef filet seasoned with smoked paprika and herbed chimichurri sauce ($19.95). But one of the best dishes we enjoyed was the tuna steak sandwich ($9.95). It was a thick, wild yellow fin tuna steak, bathed in a soy glaze and served with shredded cabbage and carrot, avocado, tomato and wasabi mayo. The fish was cooked just barely past rare: perfect. Sweet-potato fries round out that winning dish. There’s a full bar and good beer selection, but I recommend bringing your own wine. There were some adequate bottles on the small list—Ménage %uFFFD Trois and Guenoc, for example—but each good wine we attempted to order was out of stock, so we wound up with not-very-satisfying low-end vino. In fairness though, this is not the type of place I’d really expect to find an extensive wine list; probably should’ve gone with Guinness to begin with. When you tire of trendy tapas and truffle oil, I recommend a palate-cleansing trip to Ogden, where Two-Bit Street dishes up fabulous, not fancy, food and friendly vibes.